UK-Elect General Election Forecast, April 25th 2015. Hung Parliament - Labour Lead By 2 But Short By 52. SNP Forecast To Win 55 Of The 59 Scottish MPs. In the latest, detailed (top 3 parties in every constituency)	UK-Elect forecast Labour are predicted to form the largest party by just two seats, and the Scottish National Party is once more forecast to have the key role in deciding who will form the next UK government. Overall, the figure of 328 seats, the combined total for Labour + SNP MPs in this prediction, is enough for an overall majority if the two parties can come to an agreement. This forecast was made using the new, improved, UK-Elect v9.4 method which takes account of even more factors than previously. Among the inputs taken into consideration by this forecast were: national opinion polls, regional opinion polls (for Scotland, Wales and London), the exact candidates standing in each seat and whether they were the incumbent, and if so, whether they won that seat for the first time at the previous election, by-elections, constituency opinion polls by Lord Ashcroft and others (adjusted according to how many days ago the fieldwork was done), and the change in the regional and national polls since the poll fieldwork or by-election. The UK-Elect "adjust target percentages for date" option was also set for this forecast, adjusting the percentages to represent what we currently expect to happen on May 7th, rather than just using the current poll percentages as a target. This option has the affect of adjusting the input opinion poll percentages to take account of what happened in many past elections as the date of the election approached - i.e. that the support levels for the parties returned part-way towards their previous totals. In current circumstances this favours the Liberal Democrats slightly and disadvantages UKIP and the SNP. The GB percentages input for this forecast were Con 34%, Lab 33.5%, UKIP 14%, Lib Dem 8%, Green 5.5%. For Scotland the percentages used were SNP 47%, Lab 25.5%, Con 17%, Lib Dem 4.5%, UKIP 3%, Green 2.5%, for Wales the percentages used were Lab 40% Con 26%, UKIP 13%, Plaid Cymru 11.5%, Lib Dem 5%, Green 4%, and for London the percentages used were Lab 44%, Con 33%, UKIP 9%, Lib Dem 8%, Green 5% Other parties votes were not specifically set. Note that the final forecast percentages differ from the input percentages due to the methodology used (including adjusting for the number of days until the election) - e.g. the final UK target percentages used were Con 34.1%, Lab 33.4%, UKIP 13.8%, LD 8.3%, Green 5.4%. See UK-Elect Latest Forecast for the UK-Elect 'Latest Forecast' page. Click on image to enlarge. See also more maps. The final candidates list was used for this forecast - UK-Elect adjusts all seat forecasts to take account of exactly which candidates and parties have been nominated. See UK Election Forecasting Theory, Techniques and Controversial Discussions and UK Election Forecasting - A detailed explanation of the techniques used by UK-Elect for more details of UK-Elect forecasting techniques. UK-Elect v9.4 users will be able to reproduce the above forecast when using the latest, most up-to-date version of UK-Elect. 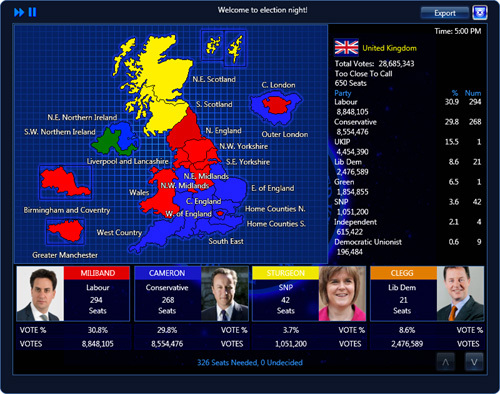 All users of a recent version can produce a similar result by downloading the latest constituency poll data from the UK-Elect downlaods page, and then doing a "Guided Forecast" specifying the separate percentages for Scotland, Wales and London together with the overall GB percentages. Note that the method used was the UK-Elect v9.4 method with all the default UK-Elect settings for that method enabled, but date-specific adjustments (adjusting the calculation target percentages depending on the number of days until the election) were used for this forecast. Results from Northern Ireland are based largely on those of the last election (with some allowance for latest polls and inter-party agreements) but primarily included for completeness only. Suggestions and Corrections: UK election forecasts are sometimes very controversial. To notify us of any suggested change to this one, or to let us know of any part of it that is just dead wrong, please email us on support@ukelect.co.uk. Can you run the 2015 General Election campaign better than the professionals? 270soft - where gaming gets political!